Cooking for company is hard. I love to cook, but planning and making a meal for guests can be stressful. I always find that I’m trying to please everybody’s taste buds, while not spending a fortune and not spending all day in the kitchen. Recently, my father-in-law was telling me that he made a Tex-Mex meal for his guests during one of the presidential debates. He said his guests raved over the food because they could personalize it to their own taste. The focus of the meal is a simple, but exquisitely seasoned beef chuck roast. I can’t take credit for this recipe, it’s my father-in-law’s masterpiece. He’s the kind of cook that doesn’t follow a recipe, he just dumps a little of this and a little of that and makes these incredibly flavorful, truly amazing dishes. This roast is definitely one of those types of dishes. This roast is so good, your guests will think you got it catered from a restaurant. But…I digress. One nice feature of this meal is that the roast can be completely cooked and ready to serve before guests arrive. It’s nice to not be bumbling around the kitchen when you should be enjoying time with your guests. Your guests can garnish their nachos, tacos, salads, or quesadillas with this decadent roast (or not, if they are vegetarian). The display of this meal is beautiful, full of so many colors. Alongside the meat, you can set out a variety of toppings; like lettuce, diced tomato, avocado, sour cream, rice and refried beans. For those who like to keep things simple, we picked up a bag of Uncle Ben’s Spanish Rice and a can of Rosarita fat free refried beans. (A tip on beans that I picked up from a friend, add a couple tablespoons of water to the beans before you microwave them. This makes the consistency so much smoother.) As the guests arrive they can start helping themselves to chips and salsa or guacamole. (Who doesn’t love to snack at a dinner party?) Then when dinner is served, the fate of everyone’s meal is in their own hands and they are welcome to create their own masterpiece. It’s hard to not like a meal that you created! As mentioned, this is a great meal for company for a number of reasons. The first of these is that the entire meal can be fully prepped before guests arrive. (It’s not that I don’t appreciate guests offering to lend a hand, but I usually find my Type A personality wanting to do it all myself.) This meal is budget friendly, a 3 pound chuck roast costs approximately $12 and the rest of the supplies are relatively cheap. You can easily feed 10 people for around $40 (and have plenty for leftovers!) And last but not least, the variety of options guests have for their meal is endless and fun! 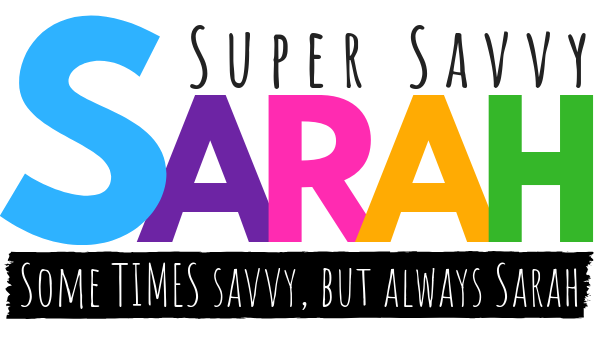 If you would like access to this dinner’s complete grocery list, as well as my super easy salsa and guacamole recipes, subscribe to Super Savvy Sarah! We used our Dutch oven to make this roast, but if you don’t have one, I would suggest using a large skillet for steps 1-4 and then add the meat to a Crockpot. Also feel free to adjust the spices to your taste. I personally don’t think the tbsp of red pepper flakes is too much (and neither did our guests), but it was spicy enough that I didn’t feel comfortable serving it to my children. Prepare the ingredients. Start by trimming excess fat from the roast (we didn’t really have much to trim.) Dice the onion and press the garlic, but don’t combine them. Then measure the cumin, red pepper flakes, and garlic salt into a small bowl. You can add the pepper to the spices or just grind it directly onto the meat. Heat the Dutch oven (or skillet) over medium high heat and cover the bottom of the pan with olive oil. To know when the olive oil is hot, sprinkle a very small amount of water in the pot. If it’s hot enough, it should sizzle. Carefully add the meat to the pan, we found that using tongs worked the best. Sear the meat for 2 minutes on all sides (including the edges). You want the meat to turn brown, but not be charred. If the pan becomes too dry during this process, add more olive oil. After searing, remove the meat from the pot. Now add the lime juice and beef broth to the onion mixture. If you are planning to use your Crockpot, you should now transfer the contents of your skillet into the Crockpot. Add the meat to the mixture. Cover and place in oven at 350 degrees. Set your timer for 90 minutes. At this time remove the meat and cut it up into smaller chunks, so that it has greater surface area and will get more tender. Place the meat back in the oven (or Crockpot) and cook for at least 90 minutes. When meat reaches the desired tenderness, remove from oven (or Crockpot) and allow to cool. Use two forks to shred. If your company is arriving soon, you can put back the meat back into the Dutch oven (or Crockpot) and keep warm until it will be served. I would suggest putting it back in the oven at 200 degrees. If you made your roast the night before (or even several days before), store covered in the fridge. A few hours before serving, either warm up in the oven or in your Crockpot. As mentioned, before company comes, prep your bowls of toppings. I personally put out diced Roma tomatoes, lettuce, cheddar and Pepper Jack cheese, rice, beans, sour cream, and homemade salsa and guacamole. I also put out 6 inch flour tortillas and tortilla chips. After you taste the roast, you will realize that the toppings are accessories to this masterpiece. I hope your guests enjoy this meal as much as ours did! If you try this recipe, let me know what you think! What are your favorite meals to make when you have company over?